We can see generalized osteopenia, widening of the diploetic space, and thinning of the outer table. This characteristic â€œhair on endâ€ appearance of the outer table is compatible with the presence of massive hyperplasia of the bone marrow, as can be seen in the homozygous state of beta-thalassemia (i.e. thalassemia major). Beta thalassemia syndromes are a group of hereditary disorders characterized by a genetic deficiency in the synthesis of beta-globin chains (adult hemoglobin usually is Î±2Î²2) resulting in excess Î±-chains and severe transfusion-dependent anemia, thus causing bone marrow hyperplasia. We have seen “hair-on-end” appearance of skull in chronic iron-deficiency anemia, sickle-cell anemia, thalassemia major and cyantic congenital heart disease. Excellent explanation and perfect answer!! We can see generalized osteopenia, widening of the diploetic space, and thinning of the outer table. 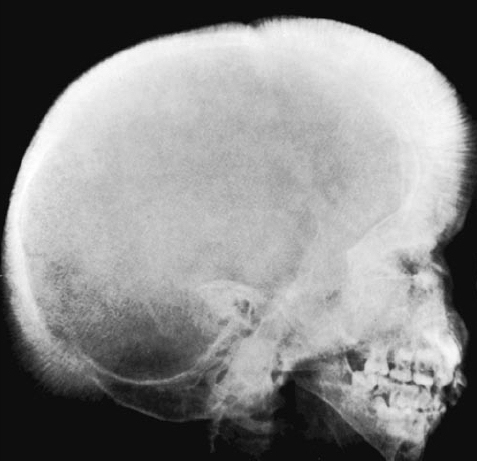 This characteristic “hair on end” appearance of the outer table is compatible with the presence of massive hyperplasia of the bone marrow, as can be seen in the homozygous state of beta-thalassemia (i.e. thalassemia major). Beta thalassemia syndromes are a group of hereditary disorders characterized by a genetic deficiency in the synthesis of beta-globin chains (adult hemoglobin usually is Î±2Î²2) resulting in excess Î±-chains and severe transfusion-dependent anemia, thus causing bone marrow hyperplasia.